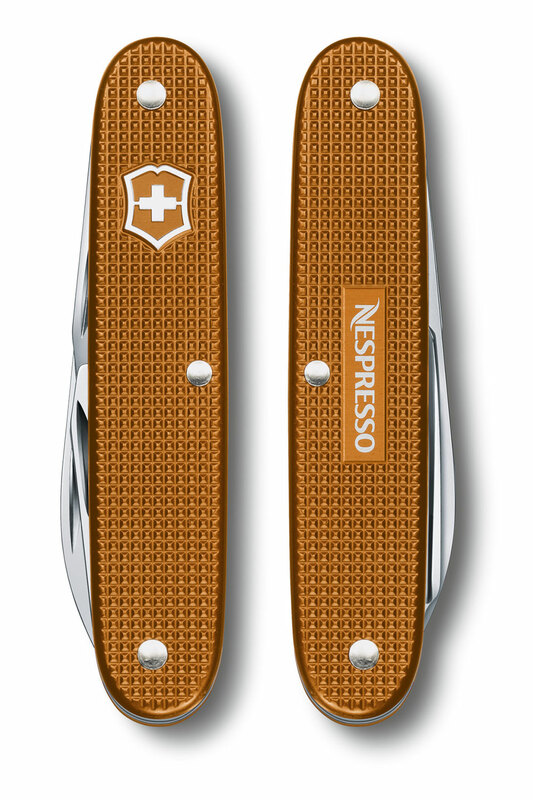 The aluminum from recycled Nespresso cups went into the body of this Swiss Army Knife. Nespresso, the quick, single-serve espresso maker, teamed with Victorinox Swiss Army to make a multi-tool knife. 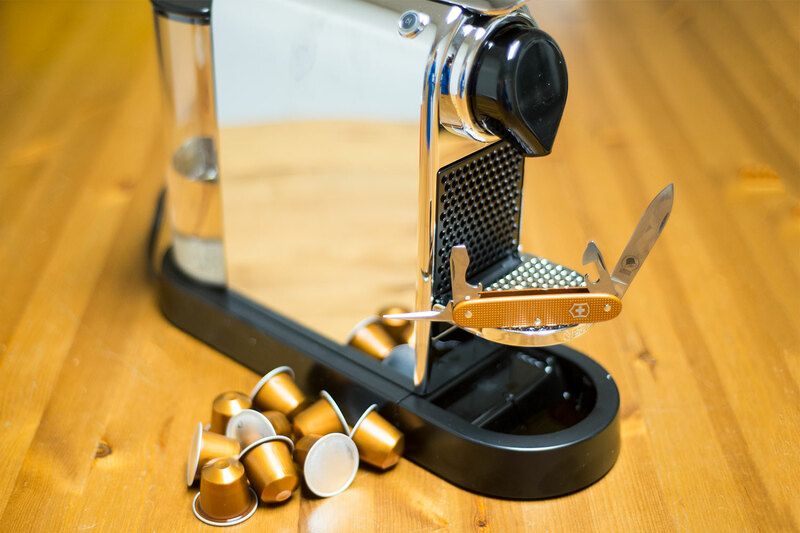 The aluminum that makes Victorinox Swiss Army’s Pioneer Nespresso textured exterior on the multi-tool’s body is made entirely from discarded Nespresso coffee pods. 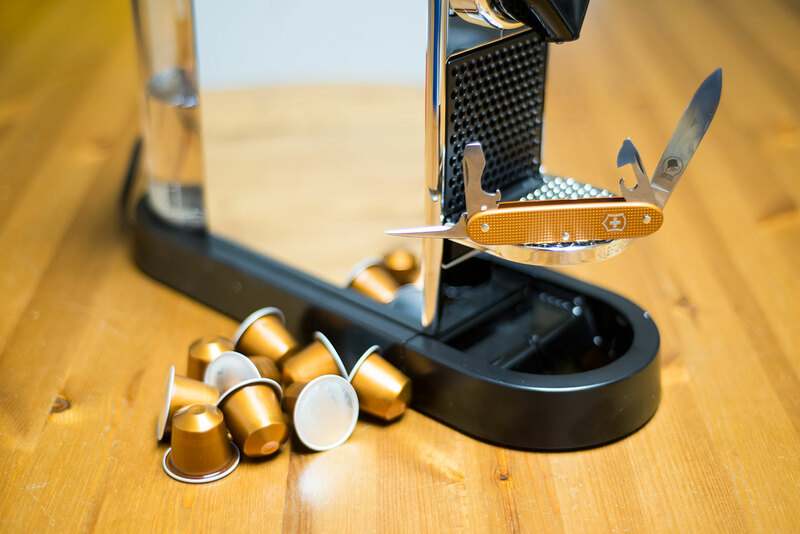 The Pioneer Nespresso multi-tool has seven functions and comes emblazoned with the Nespresso logo, touting each brand’s recycling and sustainability efforts. Victorinox only made 750 knives, which launch June 5. The knife is colored after Nespresso‘s Livanto-flavored cup, 24 of which went into the 3.7 x 0.5-inch aluminum scales. Victorinox Swiss Army took capsules from Nespresso, melted them down and cast them to fit the textured scales on the exterior of the knife. 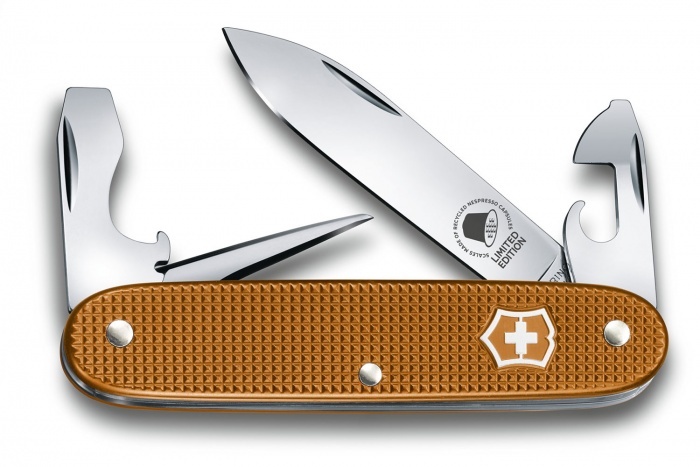 The construction matches Victorinox Swiss Army’s standard knives and still holds a lifetime warranty. The seven functions include a blade, reamer, can opener, 3mm screwdriver, bottle opener, wire stripper, and 7.5mm screwdriver. It retails for $55 and feels great in the hand. For those interested in the math, the entire campaign will recycle 18,000 coffee pods. The recycled knife fits within each company’s environmental ethos. Victorinox Swiss Army collects all of its scraps in knife production to make recycled knives. This translates to roughly 600 tons of metal used in its knives, or 25-percent of total knife production. Among a host of other environmental efforts, Victorinox Swiss Army also takes the leftover heat from the knife-making process to heat the headquarters’ offices and 120 nearby apartments. Learn more about Swiss Army’s sustainability efforts here. Also, Nespresso invests extensively in infrastructure for recycling its capsules. Each pod is entirely recyclable and can be turned in through free UPS bags, Nespresso Boutiques, and select drop-off locations. This video details Nespresso’s entire recycling process. Be sure to check back on June 5th for the knife’s release. Those wanting a long-lasting multi-tool with an environmental message should consider the Pioneer Nespresso.